A man who was charged with robbery has been remanded in custody after appearing at Staines Magistrates’ Court this morning (4 March). John Turner, 27, from Barker Road in Chertsey, is next due to appear at Guildford Crown Court on 4 April. 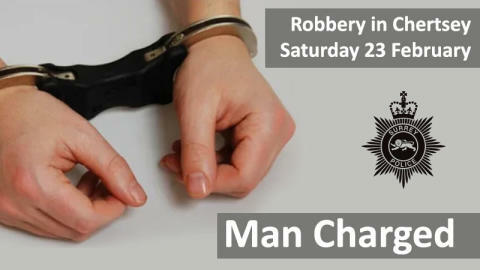 The charge relates to an incident which took place just before 3.25pm last Saturday (23 February), in Guildford Street near the library. An elderly woman was approached from behind and her handbag was snatched, causing her to fall to the ground. She was taken to hospital with a broken arm. A second man, who was arrested on suspicion of robbery, has been released under investigation. Officers are still keen to speak to anyone who saw what happened. If you saw what happened or you have any other information, please contact Surrey Police on 101 (999 in an emergency) or http://surrey.police.uk/TellUsMore quoting reference PR/45190019946.